Acquired from Mallett, London in 1979. Anonymous sale, Christie's New York, 22 April 1999, lot 138. Designed in the Louis Quatorze antique or Roman fashion, the flowered and laurel-wreathed pier glass is surmounted by wreath-bearing cherubs, while their companions emerge at the centres of the sides and base. The fashion was later popularised by Cornelius Gole's pattern book A New Book of Ornaments Useful to all Artists, 1704. 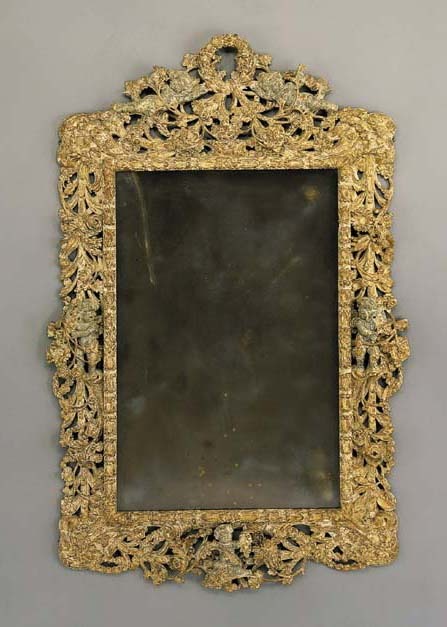 A related frame, richly fretted with cherubs and an armorial cartouche, is displayed in the Victoria & Albert Museum, London (see G. Wills, English Looking-Glasses, New York, 1965, p.65 pl. 11).